Who doesn’t remember their love at first sight? The simple circumstances, the lack of pretense, the unintendedness of it all? And the hard fall. When real characters and situations (“verismo”) rather than gods or mythological beings or those of noble rank sing the grand songs while playing out a compelling story packaged with music by an operatic composer just hitting his stride, you have hit the cover off the ball and an opera destined to play over and over again. 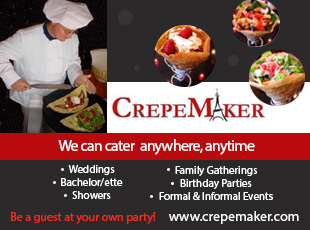 "La bohème" is the topper of that list. 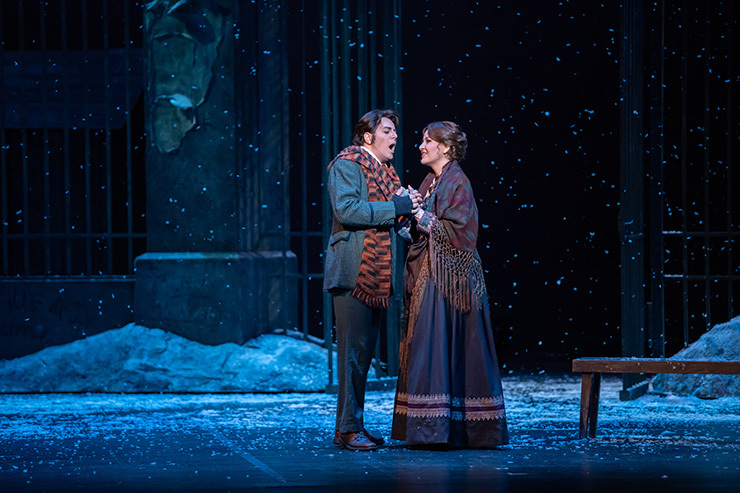 Composed by the peerless Giacomo Puccini, whose unmatched genius propelled his operas into the 20th century and whose oeuvre remains unmatched in modern times, "La bohème" once again filled the Adrienne Arsht Center Ziff Ballet Opera House on Friday, Nov. 3. It was the opening production of Florida Grand Opera’s 78th Season. 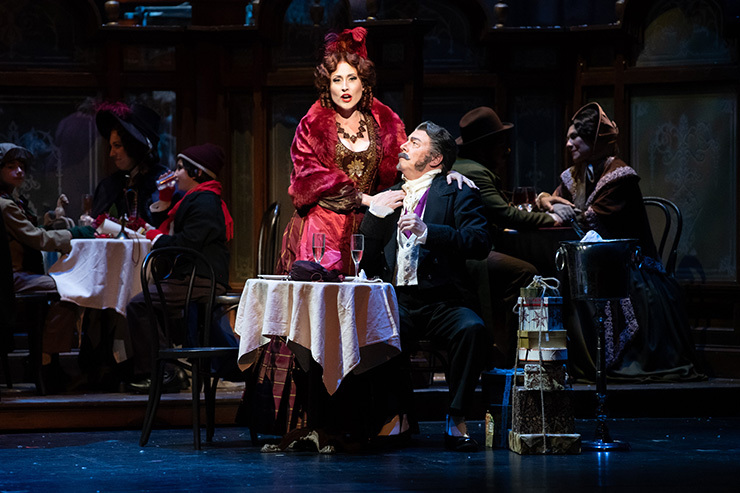 I sometimes hear that subtle “oh, not again” when a production of "La bohème" is coming to town, as if there is something unsophisticated about hearing one of the world’s most performed operas again. There is certainly no advantage in turning up your nose at another listen to The Beatles’s "White Album," watching "Casablanca" again or reading "Catcher in the Rye" once more. Nor seeing and hearing "La bohème" for the fifth time. 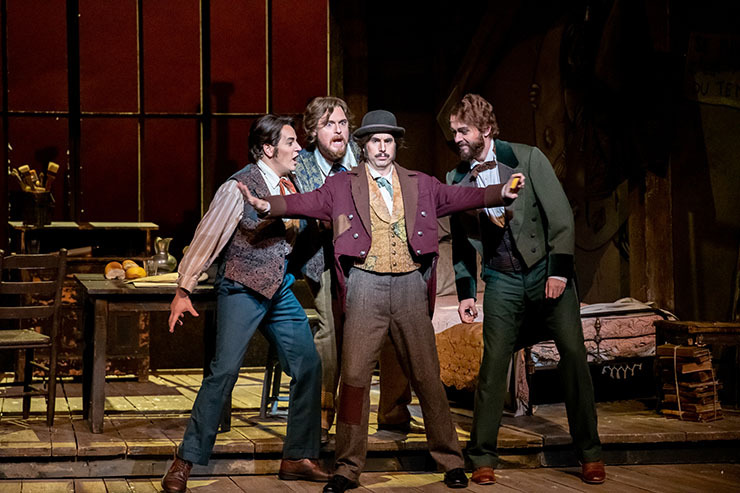 "Bohème" hits all the notes: a composer who writes what he knows (poverty), falling in love in the most innocent of circumstances and music inspired at the highest level of one’s creativity. One can only imagine Puccini sharing a little piece of himself to facilitate the writing of such glorious music. Also, one must not underestimate the level of creativity achieved resulting from a competitive battle for the same prize. The short stories by Henri Murger (“Scènes de la vie de bohème”) depicting young bohemians living in the Latin Quarter of Paris in the 1840s, simultaneously inspired both Ruggero Leoncavallo ("Pagliacci") and Puccini to write a new opera based on Murger’s material. Puccini won that battle. Condescension from some music critics who find his music “insufficiently sophisticated”missed the part that Puccini’s mounting melodies, great sense of theater and lush orchestrations transformed the art of opera and positioned it as a gateway for the story driven plots and musical sensibilities of Broadway shows to come. 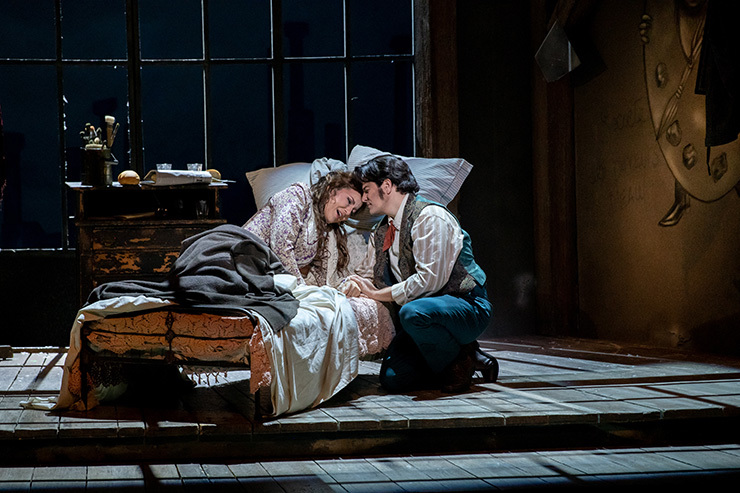 "Carousel’s" 12-minute "bench scene," where Billy and Julie are first getting to know each other, smacks of Rodolfo and Mimì’s first encounter in the garret, both earmarked with a pair of arias that are pure showstoppers. When your two leads have matching voices and sympatico to boot, your production will be thrilling. FGO had two such in its Rodolfo and Mimì. With a strong and soaring soprano, Adrienn Miksch (last seen and heard as the ghostly Marta in FGO’s 2016 production of "The Passenger") filled her Mimì with the confidence, fragility and humility endemic to the role. Her voice was at once crystal clear and mightily dynamic, showing strength and control in both her upper and lower registers. 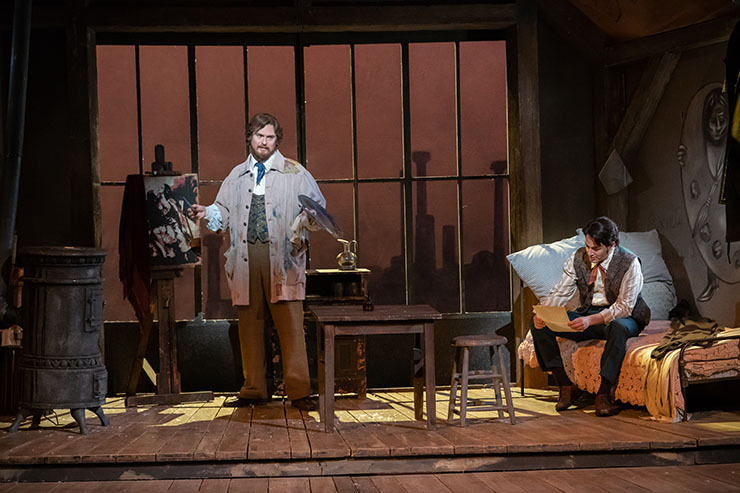 Making his FGO and U.S. debut, tenor Alesandro Scotto di Luzio made for a passionate and resolute Rodolfo, a sturdy tenor acquitting his character well with sensitivity for the text and pipes that smoothly reached his money-notes. Those first moments – the accidental (intentional?) first touch, the exchange of names, the feelings of love-at-first-sight that flood the heart and mind – they were all there in the performances of di Luzio and Miksch. Explaining to Mimì that he is a poet, di Luzio was solid with “Che gelida manina,” his considerable tenor delivering the passion and emotion of the moment with subtlety and power, sailing his money-note to the back of the hall. Miksch in turn, telling Rodolfo, that she is a seamstress, quiet and happy, caressed and intensified her rounded notes like a lover with “Sì, mi chiamano Mimì,” a fellow in the audience intoning a deep rich “Brava!” as she concluded her aria. To say both of these excellent performers have absolute physical and emotional control of their voices is understating the obvious. If you didn’t feel a little breathless after these back-to-arias, your heart was probably not working. Suggesting that the couple separate amicably, Miksch handled her aria “Donde lieta uscì” with a tender voice that rang with resolute sadness, tapping easily again into the audience’s respiratory reserves. Baritone Trevor Scheunemann, playing the painter Marcello, Rodolfo’s best friend and relationship counselor, was a formidable presence on stage, handling both his comic and dramatic assignments realistically, his muscular voice blending splendidly in his duets with di Luzio and Miksch– notably after Mimì’s impassioned “O buon Marcello, aiuto!”; in the tense scene while Rodolfo tells Marcello of Mimì’s illness, “Marcello, finalmente”; while Marcello and Rodolfo lamented over their lost loves, “O Mimì, tu più non torni” – the crispness and strength of Scheunemann and di Luzio’s voices, outstanding. Playing Musetta, flouncing about in her pink dress and matching gloves, soprano Jessica E. Jones delivered the provocative “Musetta's Waltz” (“Quando m'en vo'”), her voice climbing upward effortlessly and sweetly hanging in the air as she teased Marcello. She credibly played all the facets required of her character – the comedy, the coquettishness and her final grief. The quartet “Addio dolce svegliare alla mattina!” beginning with Rodolfo and Mimì saying goodbye to “sweet awakening,” their reconciliation in contrasting counterpoint from a bickering Marcello and Musetta hurling epithets at each other, was sublimely executed by the foursome, their voices suffused in rich harmony. The supporting bohemians and cast – bass Simon Dyer as the philosopher Colline, nicely rendering the heartfelt “Vecchia zimarra,” pawning his overcoat to raise money for Mimì, baritone Benjamin Dickerson as the feisty top-hatted musician Schaunard, bass Tony Dillon playing the dimwitted landlord Benoît and the clueless Alcindoro,the lively toy seller Parpignol played by tenor Lievens Castillo, Custom-House Officer bass Pablo Menvielle, Sergeant bass Enrique Estrada, Prune Man tenor Orlando Valdes – all consummate singers and performers. Reliable maestro Ramón Tebar helmed the spirited orchestra with precision and craft. He sharply managed the continual interplay between the brass and winds, maintaining masterful control of his orchestra, from the buoyant leitmotifs signaling the bohemians and the entrances and sub-text of Rodolfo and Mimì, to the towering heartbreaking cry of Rodolfo as the curtain fell. The jolly Quartier Latin scene with street sellers hocking their wares (“Aranci, datteri! Caldi i marroni!”) was fittingly prepped by Chorus master Katherine Kozak. Stage director Jeffrey Marc Buchman managed his stage effectively, nimbly developing the character relationships in the alternating dramatic and comic relief scenes, and adding subtle touches to enhance emotions, such as Marcello picking up Musetta’s shawl off the floor after their fight and later wrapping it longingly around his fist in her absence. And what would Christmas eve be without falling snow? Michael Yeargan’s sets included the white stuff. A pot-bellied stove and four mismatched chairs around a table highlighted the bohemian garret. Stevie O’Brian Agnew set the lighting dimly to enhance the illusion of poverty in the attic, only partially eased by lit candles. Pale yellow lit the tavern windows and Rodolfo and Mimì were bathed in a pool of white light for their final scene. Howard Tsvi Kaplan had men dressed in suits that had closely tailored pants, waistcoats and jackets. Women wore dresses that were ankle-length or slightly longer. The color palette was somewhat muted. Overcoats, shawls, capes were used to ward off the bitter December cold. Bohéme is a continuous portrayal of intense emotions. This cast was more than up to the task, validated by a five-minute standing ovation. Sung without amplification in Italian with projected titles in English and Spanish. 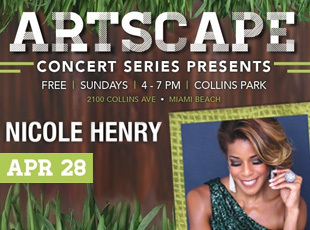 Tuesday, Nov. 6, at 8 p.m.
Thursday, Nov. 8, at 8 p.m.
Sunday, Nov. 11, at 2 p.m.
Thursday, Nov. 15, at 7:30 p.m. 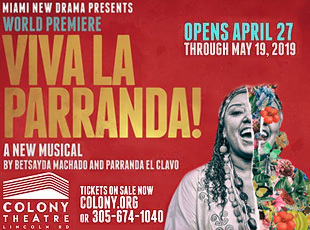 Audio Description is available without charge for blind and visually impaired patrons attending Arsht Center operas and Broadway shows. Ticket purchases can be made online at www.FGO.org or by phone at FGO’s Box Office (800) 740-1010.